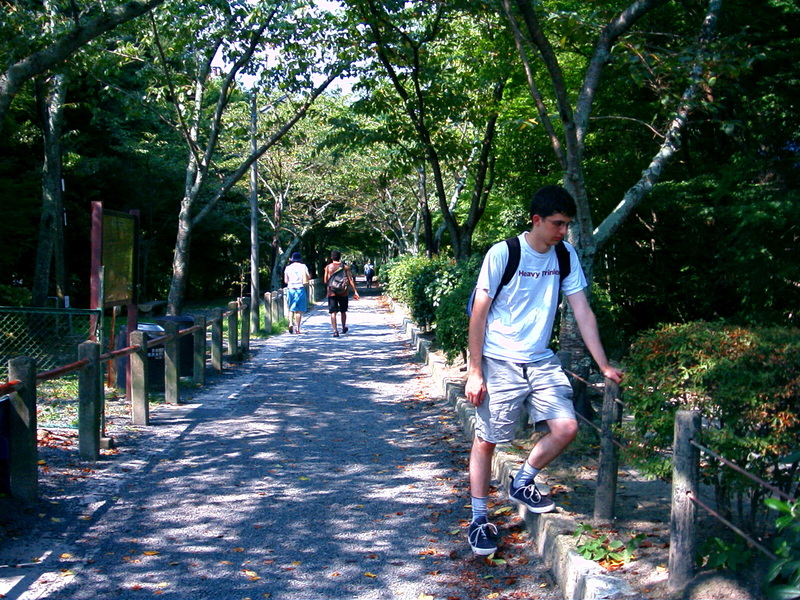 It was a hot summer day in 2002, when I and Ryan were walking along the Philosopher’s Walk. This small street along a canal that didn’t look any special for me connects Ginkakuji to Nanzenji, one of the many tourist routes in Kyoto, Japan. Ryan’s mum was right, this street didn’t feel philosophical. Didn’t evoke any special feeling. This street gained its name because a Japanese famous philosopher was said to practice meditation along this road everyday. Later on I found out that all the boring looking big trees along the canal were cherry trees, and if we had came to Kyoto in April during the sakura blossom season, this street would have looked fantastic. We picked the wrong month to see Kyoto! That was almost 9 years ago, and that marked our first backpacking journey. Back then, we were not aware of the term “backpacking“. We were both exchange students in a university in Tokyo. I was from Indonesia, and Ryan was from Canada. If we didn’t meet by chance here, our lifes would have been really different. Maybe really boring. As I said, we didn’t know about backpacking back then, let alone “budget backpacking”. What we knew was that we were a couple of poor students in Tokyo and we wanted to see the world famous Kyoto, that looked so exotic to us. So one day, with our little backpacks on our backs, and what little money we could scrape together, we set off to Kyoto. I regret being in Japan for a year and never getting a chance to ride the Shinkansen, the superfast Japanese bullet train. Shinkansen was quite expensive, except if you are a tourist and you order the ticket prior to entering the country which we unfortunately couldn’t do. So we took a series of short distance train rides on a discounted ticket for local services only. With Shinkansen, the journey would take only a couple of hours. With the way we were doing it, it took the whole day and many times we had to ride the train standing up. But then, it was much cheaper. Right from the start we didn’t really care about being well planned. When we reached Kyoto, we had no idea where to stay yet. We arrived in the station late and spent the first night in a cheap hotel nearby, too pricey already for us, with a room barely large enough to fit the futon we slept on. The next morning, we went to a visitor information office and luckily there were some advertisement for rooms for rent. We picked the cheapest one and called the number. A friendly Russian-accented voice invited us to come and check it out. It was cheap indeed, but it was quite depressing, at least because we were not so adventurous back then. The house looked and smelled like it was rotting, and sat along a drainage canal in a run down neighborhood. I couldn’t believe a place like this existed in Japan, a country I’d always thought of as clean, rich, and ultra-modern. The owner was an English speaking Russian expat with a bulbous nose, permanently cherry red from too much drinking. A nice and helpful man, but frankly not good at keeping his house clean. The bedroom was very spacious seeing the size of the little house, but the bed sheet looked as if it had been accumulating grime for the past several months without being cleaned. Moreover, cockroaches were everywhere. A cockroach kingdom occupied this room! It was difficult to fall asleep when you could hear many of them crawling around you, scuttling under the bed and in the dropped ceiling. They’d run up the frosted glass doors and windows, throwing large, monstrous shadows on the walls as they passed. The shower room was equally depressing. It was tiny and dark, and the toilet was just a hole in the ground. I know squat toilets are traditional in Japan, but anywhere else, there would be a ceramic toilet bowl on the ground, and a flush system. Not this one. This one was just a hole in the ground. Borat’s kind of toilet, if you know what I mean. It looked like they made it by knocking a hole in the floor with an axe. The room was small and dark, and the very hole was in the middle. So I accidentally stepped in that gross hole more than once. Despite the grungy house and the strong summer heat, we had a great time in Kyoto. Kinkaku-ji, the Temple of the Golden Pavilion, blew me away. It was indeed gilded with gold-leaf, making it look very yellow and shiny. The reflection of the golden pavilion on the pool water just made it even more beautiful. Ginkaku-ji, the Temple of Silver Pavilion, the other hand, didn’t look impressive because there was no silver coating on it, a let down based on its name. 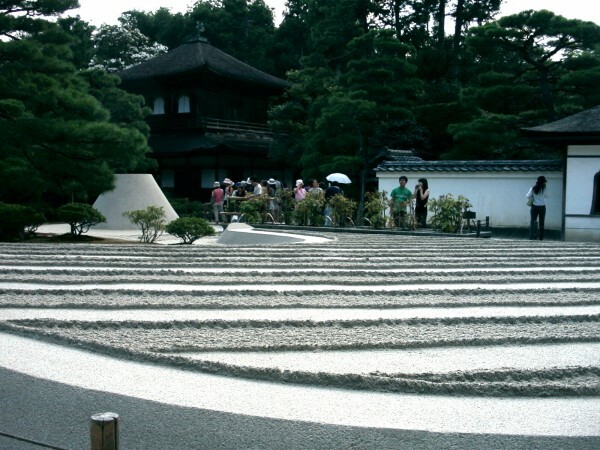 But there, for the first time, I saw a “sand garden”. Awesome! I liked imagining the monks raking it carefully every morning! We didn’t spot any geisha! Or geiko, or maiko. We waited and waited in the Pontocho and Gion district, but we had no luck. Just as with my fate never riding on Shinkansen, I never saw a real geisha during my one year stay in Japan. What a bummer! One lovely aspect of Japan is that they have the modern and traditional life goes side by side. 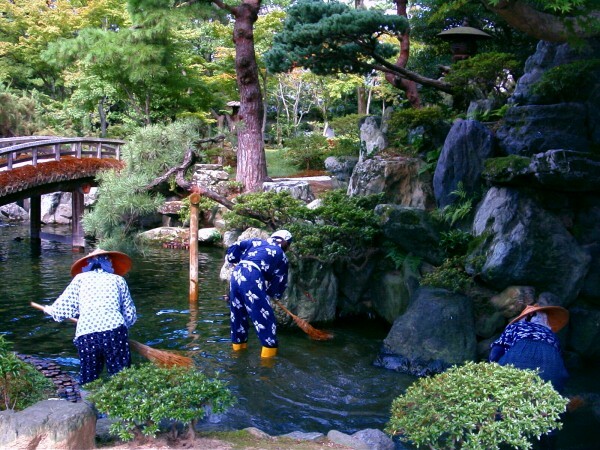 In such a modern country, we saw the gardeners of Kyoto Imperial Palace wearing their traditional working uniforms cleaning a pond, by literally standing inside the pond and sweeping it! Sweeping out a body of water, I’d never seen that before. Roaming Kyoto with Ryan, I experienced a kind of freedom that I’d never felt before. The concerns of the world, the social obligations, and the monotonous routine, all fell away and we were focused purely on the enjoyment of exploring and experiencing the new. For the first time I was living without worries or regrets, entirely in the moment. The little discomforts of travel seemed like nothing beside that feeling of liberation. On our way back to Tokyo the trains were crowded with families and young people heading to the natsu matsuri, or summer festivals. That night the skies were lit up by fireworks in villages all across the countryside. And as we sat on the train gazing at the fireworks in the distance, I thought back on the adventure was coming to an end. I didn’t know it yet, but a little seed of an adventurous life was planted in my heart during this short trip. And over the years it would grow, until we decided to adopt a lifestyle of full time nomads, exploring the mysterious world! What about you? When did you catch the travel bug? *If you love Japan and have been there, please join us in creating “Best of Japan by Travelers Around the World” photo-post! 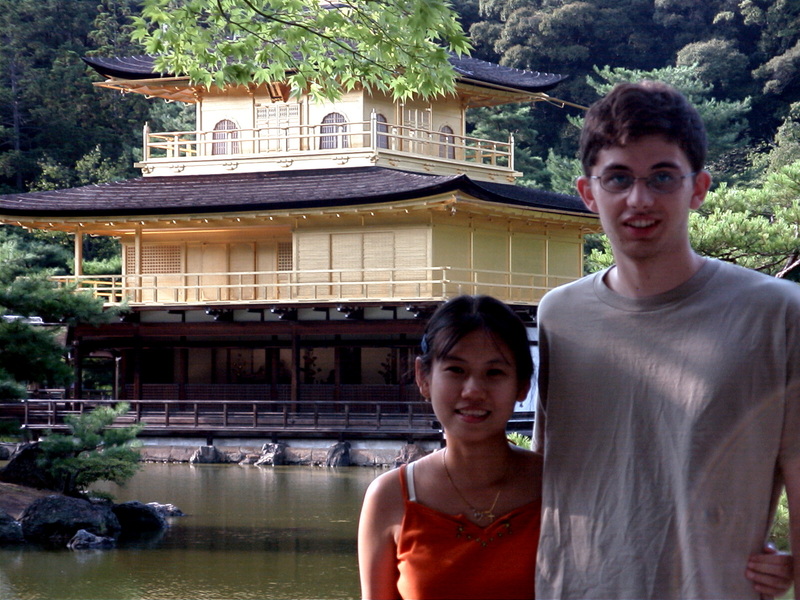 It was a hot summer day in 2002, when I and Ryan were walking along the Philosopher’s Walk. This small street along a canal that didn’t look any special for me connects Ginkakuji to Nanzenji, one of the many tourist routes in Kyoto. Ryan’s mum was right, this street didn’t feel philosophical. Didn’t evoke any special feeling. Later on I found out that all the boring looking big trees along the canal were cherry trees, and if we had came to Kyoto around early of April during the sakura blossom, this street would have looked fantastic http://www.japan-guide.com/e/e3906.html. This street gain its name because a Japanese famous philosopher was said to practice meditation along this road everyday. We picked a wrong month to see Kyoto! That was almost 9 years ago, and that marked our first backpacking journey. Back then, we were not aware of the term â€œbackpackingâ€. We were both exchange students in a university in Tokyo. I was from Indonesia, and Ryan was from Canada. If we didn’t meet by chance here, our lifes would have been really different. Maybe a really boring one. As I said, we didn’t know about backpacking back then, set alone â€œbudget backpackingâ€. What we knew was, that we were a couple of poor exchange students in Tokyo and we wanted to see the world famous Kyoto, that look so exotic in printings and screens. So one day, with a little backpack in our back, and a little money, we set off to Kyoto. I regret being in Japan for a year and never ride on Shinkansen, the superfast Japanese bullet train. Shinkansen was really not that cheap, except if you are a tourist and you order the ticket prior to entering the country. So we took a series of short distance train rides. With Shinkansen, the journey would take only a couple of hours. With the way we were doing it, it took the whole day and many times we had to ride the train standing up. But then, it was much cheaper. Apparently since those years, we didn’t really care about being well planned. When we reached Kyoto, we had no idea where to stay yet. We arrived late and we spent the first night in a cheap hotel â€“ too pricey already for us â€“ with the room size only slightly larger than the futon. The next morning, we went to a visitor information office and luckily there were some advertisement for room rents. We picked the cheapest one. It was cheap indeed, but it was quite depressing, at least because we were not quite adventurous back then. The house looked and smelled rotting. I couldn’t believe that there’s a neighbourhood like this in a big city of Japan that was one of the most modern and rich country in the world. The owner was a an English speaking expat with rather red face. A nice and informative man, but frankly not good at keeping his house clean. The bedroom was hilariously spacious seeing the size of the tiny house, but the bed sheet looked as if it had been accumulation grime for the past several months. Moreover, cockroaches were everywhere. A cockroach kingdom occupied this room! It was difficult to fall a sleep when you could hear many of them crawling around you. The shower room was equally depressing. It was tiny and dark, and the toilet was just a hole in the ground. I know squat toilet is Japanese traditional toilet, but anywhere else, there would be a ceramic toilet bowl on the ground, and a flush system. Not this one. This one was just a hole in the ground. Borat’s kind of toilet, if you know what I mean. Imagine smashing the floor tile with an ax, it will look like that. The room was small and dark, and the very hole was in the middle. So accidentally I stepped to that gross hole several time. Despite of that depressing house and the strong summer heat, we had a great time in Kyoto. Very nostalgic. Kinkaku-ji, the Temple of the Golden Pavilion, blew me away. It was indeed gilded with gold-leaf, making it looked very yellow and shiny. The reflection of the golden pavilion on the pool water just made it even more beautiful. Ginkaku-ji, the Temple of Silver Pavilion, the other hand, didn’t look impressive because there was no silver coating in it, disappointed my expectation based on its name. 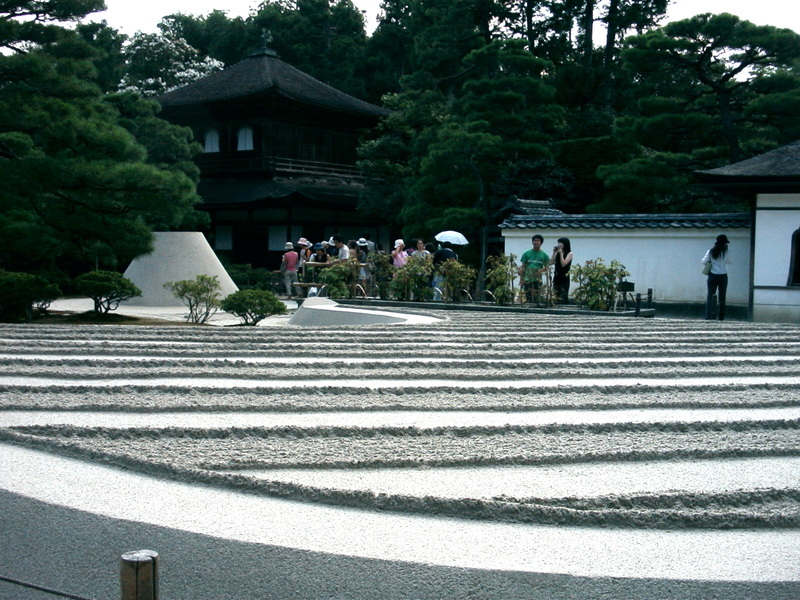 But there, for the first time, I saw a â€œsand gardenâ€. Awesome! I liked imagining the monks raked it carefully every morning! We didn’t spot any geisha! Or geiko, or maiko. We waited and waited on the Pontocho and Gion district, but we had no luck. Just as with my fate never riding on Shinkansen, I never saw a real geisha during my one year stay in Japan. What a bummer! If we failed observing a geisha’s hair style, at least we saw a real wacky hair product: human hair rope! It was in Higashi Honganji Temple. The normal rope at that time was of low quality, while a human hair rope â€œkezunaâ€ had a better quality. So followers donated their hair to be woven into big ropes to help the construction of the temple. The hair rope on display was 69 meter long, 30 cm circumference, and weight 375 kg. But this was just one of many ropes, the largest one being 110 m long, 40 cm circumference, and over 1 ton of weight! My favourite spot in Kyoto? Kiyomizu Dera! A temple complex built in a hillside overlooking the Kyoto city. The buildings were built without a single nail, and there’s a waterfall within the complex (kiyomizu means pure water). The harmony between the architecture and the nature created the magic for me. No wonder it was one of 20 finalists for the â€œNew Seven Wonders of the Worldâ€ (even though honestly I think this new wonder list and the voting system were pointless). A few days after the first time ever I had my feet stuck in any type of toilet hole, we were on the way back to Tokyo. This time a year, natsu matsuri, or summer festival, was held everywhere. The trains were full with young people in summer yukata going to and coming back from the festivals. As I sat on the train and gaze at the fireworks in a distance, I thought back on the adventure was coming to an end. I didn’t know it yet, but a little seed of an adventurous life was planted in my heart during this little trip. And over the years, it would grow, until we decided to adopt a lifestyle of full time nomads, exploring the mysterious world! What about you? How did it started for you? If you love Japan and have been there, please join us in creating â€œBest of Japan by Travelers Around the Worldâ€ photo-post! Ha! Love the old photos guys. I first caught my travel bug when I moved to Honolulu, Hawaii for a year and worked at a backpacking hostel. Meeting cool people from all over the world and listening to their crazy stories made me jealous! I wanted those experiences too. Hahaha, I won’t be surprised! They have temple dedicated to rats (just along the philosophy walk I think)! Don’t they have temple dedicated for rats too in India? That was shocking for me too. I didn’t know that they still have that in the middle of city! But then, in our dormitory in Tokyo, there were a lot of cockroaches too. The small kind though. This one in the Kyoto room were big and they can fly. Annoying! Awww! I loved reading about and seeing young Dina and Ryan and learning how you met Not happy for you about the cockroach infested room/flat, of course, but I’m really glad you shared this story about you two. Thanks Heather! I somehow thought of cockroach and that made me wanted to write this!! For non American, going to Florida and Chicago is a really awesome thing You will love Japan, the country is very different, the people are too. Very unique, many times bizarre. Check out the winner of the Travel Roulette 20 Clothes (post after this one), it’s an example of how weird that could be! What a wonderful adventure (except for that house…). Sweeping out a pond. Hmm… Sounds like Monty Python, but seeing it in action in the photo makes it believable! I have memories of Japan from two decades back, and would love to return. My first trip was to Hong Kong and Japan (time before the above mentioned longer stay)in my early twenties, and I’ve never wanted to stop travelling since then. All the best from Santiago, Chile. Aah…I would of lost my mind with the cockroaches! Mice and rats are okay, but bugs really put me over the edge…haha. I have a totally clean image of Japan too, and really hope I don’t run into any cockroaches when we visit. I didn’t catch the travel bug until Chris and I went to Paris when I was 19. It was amazing!!! We took the metro from the airport and my first views of Paris when we came out of the metro where unbelievable. I had never been anywhere so architecturally beautiful before. Instantly hooked!